The paper of record says Greeks should look to the example of Argentina’s 2001 default. But that default actually seems to have tremendously benefited the country. James Stewart had a piece in the New York Times telling readers that if Greece were to leave the euro, it would face a disaster. The headline warns readers, “Imagine Argentina, but Much Worse.” The article includes several assertions that are misleading or false. First, it is difficult to describe the default in Argentina as a disaster. The economy had been plummeting prior to the default, which occurred at the end of the year in 2001. The country’s GDP had actually fallen more before the default than it did after the default. (This is not entirely clear on the graph, since the data is annual. At the point where the default took place in December of 2001, Argentina’s GDP was already well below the year-round average.) While the economy did fall more sharply after the default, it soon rebounded, and by the end of 2003 it had regained all the ground lost following the default. 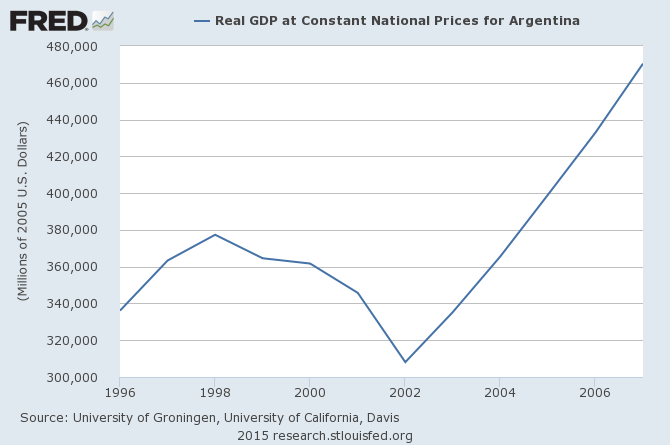 Argentina’s economy continued to grow rapidly for several more years, rising above pre-recession levels in 2004. Given the fuller picture, it is difficult to see the default as an especially disastrous event, even if it did lead to several months of uncertainty for the people of Argentina. In this respect, it is worth noting that Paul Volcker is widely praised in policy circles for bringing down the U.S. inflation rate. To accomplish this goal, he induced a recession that pushed the unemployment rate to almost 11 percent. So the idea that short-term pain might be a price worth paying for a longer-term benefit is widely accepted in policy circles. The pre-default decline has been much sharper in Greece than in Argentina: over 25 percent in Greece, compared to less than 10 percent in Argentina. This should mean that Greece has much more room to bounce back if it regains control over its fiscal and monetary policy. At one point, the piece refers to the views of Yanis Varoufakis, Greece’s finance minister, on the difficulties of leaving the euro. It relies on what it describes as a “recent blogpost.” Actually, the post is from 2012. But they’ve already cut prices and tourism has gone up. But it hasn’t really helped, because total revenue hasn’t gone up. Actually, tourism revenue has risen. It rose by 8 percent from 2011 to 2013 (the most recent data available) measured in euros, and by roughly 20 percent measured in dollars. In arguing that Greece can’t increase revenue from fishing, the piece tells readers, “The European Union has strict quotas to prevent overfishing.” However, the piece also tells readers that leaving the euro would cause Greece to be thrown out of the European Union. If that’s true, the EU limits on fishing would be irrelevant. The piece also make a big point of the fact that Greece does not at present have a currency other than the euro. There are plenty of countries, including many which are poorer than Greece, who have managed to switch over to a new currency in a relatively short period of time. While this process will never be painless, it must be compared to the pain associated with an indefinite period of unemployment in excess of 20 percent, which is almost certainly the path associated with remaining in the euro on the Troika’s terms. In making comparisons between Greece and Argentina, it is also worth noting that almost all economists projected disaster at the time Argentina defaulted in 2001. Perhaps they have learned more about economics in the last 14 years, but this is not obviously true. A version of this post originally appeared on the Center for Economic and Policy Research’s blog Beat the Press. That's simply not true. 90% of the loan money did NOT go back to the loan. Not even close. Greece has complied with every demand for the past five years. About 90% of the loan money has gone to pay off previous loans. It's like borrowing from a loan shark to pay off the vig on the first loan. The banks are the recipients of the bailout money, not the Greek people. 480 billion doesn't count as help? This disaster is on the Greek government, not Germany. By now it is clear Adolf Merkel & Co. have no real intention of helping Greece and are intent on Greece's destruction. As pointed out in a Huffpost piece, even if Greece accepted their terms, the Greek debt would be unsustainable beyond 2030. Some friends. There is no end to history or struggle. The world is not captured by malevolent untouchable forces. It is the illusion of control and the faith the people have in it that has giving these oppressive forces power. There is a sense of being overwhelmed that exist, but that just because people can't see a way to fight the system. I don't know much but I do know this - apathy and hopelessness is not going to help society find a way counter neo-liberalism. 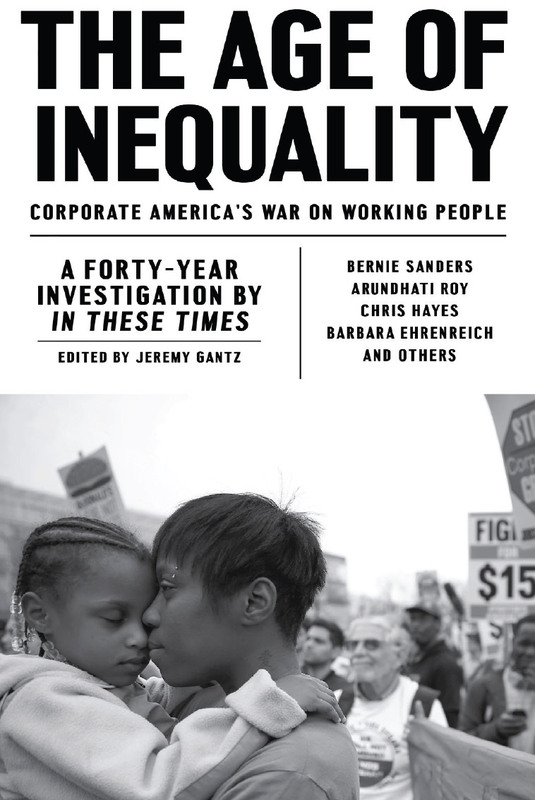 A global class war between the 0.01% and its stooges, the 10%, and the rest, is raging, and it will only get worse. The Western oligarchs showed, by their naked embrace of fascism and genocide, in Ukraine, Egypt, Iraq, Libya and Syria, that they will defend their neo-feudal empire at any cost in human suffering and lives. It might be possible for Greece, Spain and Italy to form an alliance to counter western neo-liberalism. They would control most of the north Mediterranean, and also form an alliance with South American countries that have managed to break the US's neo-liberal ambitions, so far. It will not be easy, and I fear violence is on the horizon in Europe. Internal or external violence there will be a campaign in elite circles to crush this kind defiance Greece is showing. With Spain being the next in line for rebellion against the neo-liberal machine, the established order is going to desperately try to put this genie back in the bottle. If Syriza triumphs, the banksters will attack, the corrupt ratings agencies will attack, the NED and other interfering Western NGOs will swarm across the country, defending 'democracy' ie the most Rightwing party around and, if necessary, the military will be rolled out again. The possibility that any society might escape neo-liberal neo-feudalism is unacceptable, Full stop. As Noam Chomsky might say, Greece's biggest crime is practicing independence. The EU is a neo-liberal organization with ambitions of creating third world European countries to serve the larger EU economies. Greece isn't just about debt; it is about the principle that power is not to be challenged. If Greece can somehow manage to slip out of the death grip of its creditors, Spain and Italy could be the next dominos to fall. A sweet old fascist intellectual like Henry Kissinger would call it a contagion and advocate for a genocidal bombing campaign. But, how will the EU (Germany) respond? That's the question Europe faces right now. With America trying desperately to restart the cold war, Russia cooperating with its own ambitions, and the populations of the northern European countries drifting toward the right, the chances of peaceful resolutions are looking grim. Despite the years of social savagery and the misery and suffering inflicted by the sado-monetarists, Greek debt increased by 50% under austerity. You can see from the thanatocrats' hysterical reaction to the threat of democracy, and their naked political intervention and vicious calumnies, that the elite parasites can see their blood-sucking system is under threat. So they incite the greedier half of the Greeks to vote yes for austerity-austerity for others, not themselves, of course. Thus they can set Greece up for either a broken Syriza and the return of Rightwing rule, or civil strife and military intervention. They will make an example of Greece to intimidate Spain et al.